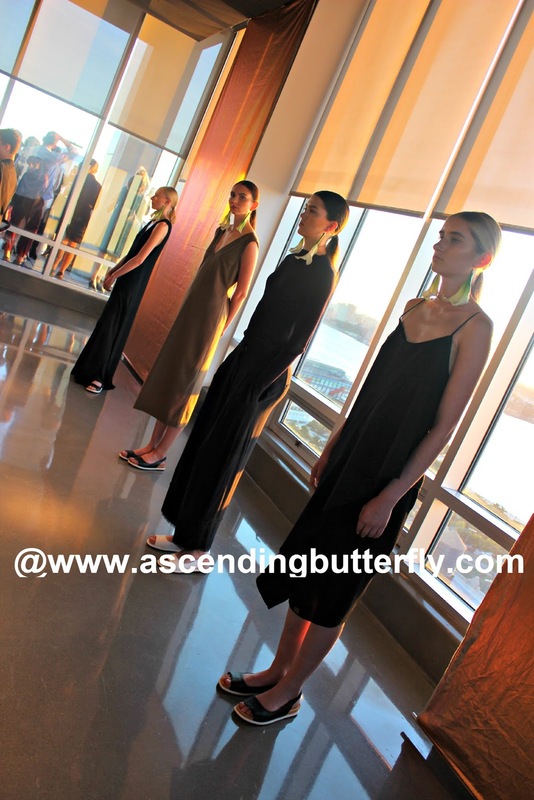 New York Fashion Week survived it's transition from Mercedes Benz Fashion Week at Lincoln Center to a frenzy of shows occurring at various locations in Manhattan including Chelsea Piers. New York Fashion Week will always be a mix of chaos and champagne that local New Yorkers look forward to with an even mix of anticipation, excitement and a bit of dread, it's exhausting! From the outside I can see where it looks glamorous, entertainment news shows make it look exciting, but they are breaking it into bite size chunks, where the highlights and best parts are what you see. The reality? It's not that glamorous, those flashing lights that last such a short time require a ton of prep and hardwork. I tend to prefer the shows with a unique backstory, each year there has been a different show that gets highlighted, one year it was EMU Australia - because I actually wear them, their boots are super comfy and their fashions are too (Check out my coverage of their 2011 Fall Fashion Week Show HERE), another year it was when Cabiria was the first Plus Size Fashion Designer to be included in Mercedes Benz Fashion Week (you can revisit that moment with my recap coverage HERE), there was the time I met Mark Cuban at a #streetstylerunway Fashion Show (See that one HERE) and this year I attended Cosmopolitan Magazine's Emerging Designer Showcase Featuring KALLMEYER New York held at Manhattan's Glasshouses which offered stunning views! "KALLMEYER's vision is to empower women, to remind them that it is their inner essence and not money, success or experience that makes them the cool and classy woman they aspire to be. By starting off small and focusing on simple beauty in life - fresh cut flowers, a beautifully tailored white shirt - she can be that woman, today. Daniella Kallmeyer applies this philosophy to every design with careful intention and purpose to each uniquely updated wardrobe staple - a tailored jacket, a perfectly cut trouser - and special attention to fabrics and fit. Each piece is an assurance of elegance in that moment, but can be added to her wardrobe portfolio, offering her a timeless collection of enduring value for years to come." Above: The first thing I noticed were the flower earrings! I think it's because of my 'Frida Kahlo' summer at Botanical Garden (those in the know get the reference, but if you don't, click HERE) - and I know the outfit on the left is giving you 'romper' vibes, but it's actually not, I love the resort wear feel of it though! Above: I blame Robert Palmer for girls all looking straight into the distance like you are not there, so when I catch a model that actually 'sees me' I have to capture it! And can I get a 'heck yeah' on the comfort footwear? Amen! Above: Another 'non-Robert Palmer' moment, gotta love it! Can you get a hint of the beautiful views this venue offers? I definitely got some outdoor shots! The dresses and flower earrings are making me wish I was on a Tropical Beach Vacation right now instead of at my computer! Above: As many of you know I'm called #TheOfficialTwitterPartyDJ on Twitter, and I have much respect for Lady DJ's, Props to the team at Glamour Magazine on securing DJ Kalcutta for this event. 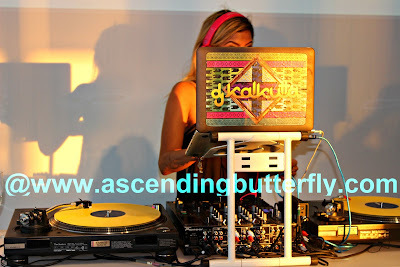 I do have shots of her face, but I like the 'DJ in action' immersed in her work vibe this shot gives off! Above: Designer Daniella Kallmeyer was all smiles at the end of her fantastic show, and it is with great reason that she has been labelled 'one to watch' and featured in publications such as WWD, Elle UK, Refinery 29 and more! Goodie Bag Contents: Cosmo Mag, Elizabeth Arden Superstart Skin Renewal Booster, Glam Squad hair tie, and Smart Water! 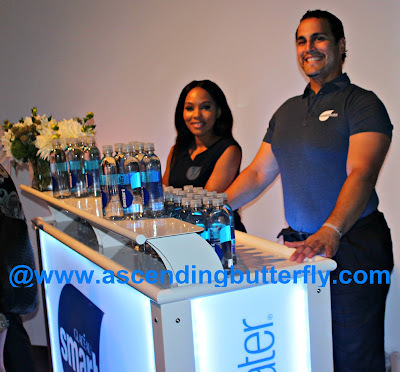 Sponsors of the event included: Elizabeth Arden, Smart Water and Air Optix. I love attending Emerging Designer Fashion Shows, and I greatly enjoyed the peek at Daniella Kallmeyer's Spring 2016 Collection! I definitely look forward to seeing more. By the way, I love that among the leather goods sold on her site, her collection includes a Limited Edition Silver Mini Pinned "Blogger" Bag which accomodates an HD camera, notebook and evening essentials. A Liquid Silver Italian Leather Handbag with silver original hardware. JUST THIS! Smart Cookie! I am thinking I totally need this in my life right now! (Especially since I tend to wear silver jewelry!) Hmm.....I'm thinking this would also be perfect for our "Featured Handbag in the Spotlight" special feature, I'm going to have to reach out to Daniella! What do YOU think of the collection? Would you rock these pieces? FTC Disclosure: I attended the show as Digital Media/Press. All opinions are 100% MY OWN. this post is NOT compensated. I did receive a gift bag. I am disclosing this in accordance with the Federal Trade Commission 16 CFR, Part 255 - Guides Concerning the use of endorsements and testimonials in advertising, you may check our Giveaway and Disclosure Page for additional information regarding Ascending Butterfly Disclosure. I would love, love, love to attend fashion week in NY! And that footwear - amazing - no slipping, sliding and falling on the runway. I also love the LBD the designer has on - so pretty! It's really a disillusion that New York Fashion Week isn't all that glamorous, although the shows with the good backstories are better than those in which lots of money and glamor was pumped. I like the mission statement you share, it's truly empowering. I have never been to a fashion show, but have always wanted to see one. We have a smaller version of fashion week here in Boston, but it's nothing like you guys have. I would imagine behind the scenes would not be glamorous, I would imagine that it would be chaotic. It still would be fun to see one at some point! @Jeannette - You should totally do it! Many times people go to one and they are done! They feel "I've done it, and finally got it out of my system' and never do another! I have not been to a fashion show like this before it looks like a lot of fun. I would just adore being able to see Fashion Week in person. I can't imagine how challenging it must be for those models to maintain the blank stare for so long. At least they've got comfortable shoes. My girlfriend is always talking about fashion week in New York. I think she'd love a behind the scenes look, even if all the glamour is on the runway. @Ben - It's chaotic but fun behind the scenes, you get to see what products are being used for hair and makeup, and those are elements to the coverage as well so it's fun to get a behind the scenes peek of these elements as well. @Cat - I totally recommend doing it, at least once! I also attend Full Figure Fashion Week in New York City, which I LOVE as well! I've never been to Fashion Week but always heard it was amazing. Love your pictures and THAT VIEW is amazing! Oh I love that mission statement it is very inspiring! I never been to fashion week, but I would love to attend and see all the latest fashions. 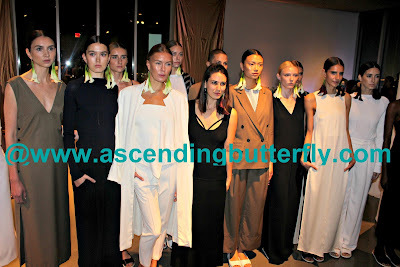 @savannah - What's great is the Fashion Week you attend (be it in February or September) is a year ahead, so while it was Fall 2015 we were previewing Spring/Summer 2016 Collections from most designers! I love those flower earrings. I couldn't pull them off but the model is rocking them. @Pam - I have to admit I noticed the earrings and footwear first! Those earrings, with your hair worn back and a pretty maxi dress would be perfect for summer or resort wear! Great pictures! NYC sounds amazing to be there for Fashion Week. @Newlywed - It's a very busy week, many brands piggy back on the event to host open house events in their showrooms during the evenings, and the afternoons have beauty suites peppered in too, so it's Go! Go! Go! The whole week. By the end of it you are totally running on fumes! Oh my gosh what a fun event to attend. I love that they are wearing comfortable shoes, for me the heels just aren’t realistic for my fashion. These are cute dresses to, love the goodie bag! @Jennifer - Same Here, I rarely wear high heels, my schedule is just so busy and I'm always overbooked and navigating the subways is just easier in pretty flats! I can't wait to dive into that Elizabeth Arden Serum, I'm a big Serum lover and hope this one is as divine as it sounds! Love the pictures and the view ' gotta love nyc !Kallmeyer's designs look very comfortable. I love the model's white lily earrings and the designer's burgundy ones. Such a nice touch to match her girls! @Lindsey - I was totally digging the flower earrings! I could see me wearing those at a sunny beach resort while on vacation! I have never been to a fashion show before. i do love to hear from others who have gone. I do think I could rock a couple of those outfits. If and only if they had my size. Chaos and champagne sounds good to me! Looks like a lot of fun! It looks as if most of the pieces in this collection are quite comfortable, which is a very important quality when it comes to me purchasing clothing. The black and white striped skirt and jacket set especially caught my eye. @Marcie - I'm a comfort gal also. 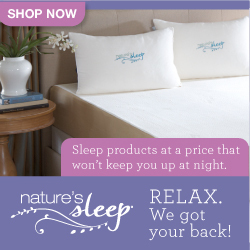 Anything that doesn't go from runway to a 'real lifestyle' is rarely what you will see featured here! Very cute! Some of these styles feel to have a bit of a 90's reference, did you feel that too? @Boulder Locavore - Indeed! That is what many people were discussing as we left the venue. I did get a 90's vibe from this collection! And as I greatly enjoyed the 90's and my College Student Years very much that is probably why the collection resonated so much with me! @Maria - Fashion Week is always fun, and exhausting! Glad to know you would wear these pieces. I like keeping in touch with designers who design for the modern woman! I have never been to a fashion show, but it would be so much fun. I know I shouldn't, but I envy you! @Cynthia - Oddly enough I never considered myself a real 'Fashionista' either, but the more my blogging allowed me an insider's view of the industry the more fascinated I became. The same holds true for me with makeup, I wear it more now because I have learned to use it better by my partnerships with makeup brands and artists. Glad you enjoyed the peek into Kallmeyer Designs Spring 2016 Collection. Wow, that must've been an amazing experience! Fashion Week! So cool! I actually love some of the pieces in her collection. Very sleek and sophisticated. I hope one day i can attending one of the amazing events! @Felicita - Definitely, you have to experience it at least once! I'm not all that into fashion, but I think fashion week would be so neat to attend. I would love to see and possibly meet all the celebrities! @Holly - Not always so easy to meet the celebs at the shows, but it is neat often being in their company at the shows! I am not much into fashion. I am a basic tee and blue jeans kind of person, however, it would be cool to be able to attend an event like this. I always wondered how these models can do what they do. @Eileen - Same here, I am a DENIM FANATIC, Jeans and a Tee are my first loves also. My work schedule doesn't often allow it so it is mostly relegated to weekend wear now. I am not a fashion girl, too. Tee and jeans are my usual outfits. I have never been to a fashion show, but I would love to attend one if given a chance. It would be nice to see all those glamorous models sporting a new collection. @Six Time Mommy - Definitely fun! Isn't that the way? The short takes look glamorous, but the behind the scenes can be taxing. Still and all I bet it was worth it in the end. The pictures are great. @mail4rosey - I'm glad my pics did the collection justice! And the designer was super approachable! I have always wanted to go to a Designer Fashion Show. My Daughter would love it. These are great designs. I love the dresses. @Ann - It would be so awesome if you and your daughter could go together! I got to attend Fashion Week once with my mom and she greatly enjoyed the chance to see it in person and not just on tv or the web! I want nothing more than to attend NYFW. Were you asked to attend? I love the collection and would love to see a show by an emerging designer. @Alexandria - NYFW is definitely by invite only. There are some designers who host their own social media contests to win a pass to their show, so keep an eye out for those types of contests. Who wouldn't want the chance to win their way in right? I find Emerging Designer Shows Suit me better, it's not the same old same old and there is something a bit more laid back and approachable about the whole thing! I was also invited to speak at Milan Fashion Week a few years ago, but couldn't make the trip work due to work and personal obligations that week. It's on my radar and thankfully I'm on theirs, it would be fun to swap one year and have a milan blogger cover NYFW and me cover Milan Fashion Week since I'm based in New York! Sounds like something really fun to attend. We don't have anything like that here. I love their flower earrings. I love what the designer is wearing. None of the modles clothes interests me but it would be nice to attend a fashion week. I've never been to a show yet either. I love your Robert Palmer observation! You know, I thought I was the only one who ever heard of Emu. I remember when I bought my first pair, everybody thought they were a generic Ugg boot. I paid close to $300 on them and I loved them and had them for years. Definitely one of my favorite purchases.